I know I’m supposed to stare longingly into my baby’s eyes while I breastfeed her, but let’s be real. Half the time she’s suckling away WHILE sleeping, the other half I’m struggling to keep my own eyes open. And books just don’t do it for me when I’m drained and tired. But TV does. And not just any TV. Only certain shows make the cut when I’m trying to keep my cool at 3 am. There’s something special about these kind of shows. They’ve all got strong female leads (duh, those are the best), but more importantly, they won’t leave you in tears. Sorry Grey’s Anatomy, you’re a wonderful show but NOT what I need to see while hormones are zipping through my sleep deprived body and I’m cradling my newborn. So if it’s 3 am where you are and you’re trying to figure out how to keep yourself awake, distracted, and calm, add these shows to your list and relax a bit! 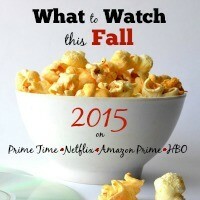 There are so many things I love about Fall, but definitely one of the best are all the new and returning shows coming back from their summer break. And this year is definitely no exception. Not only are there some awesome cliff hanger to wrap up, but there are quite a few new and definitely promising shows that I can’t wait to get more of. 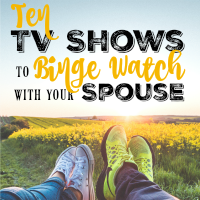 So the next time you’re in need of tv shows to watch with your wife or husband (that you’ll both love), just check out this list because I’ve done the research for you! All of these shows have been vetted by yours truly (along with my husband of course) and are without a doubt the best of the best. 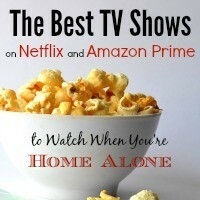 There’s a trick, however, to picking the right shows to watch when you’re home alone. This is not the time to catch up on Grey’s Anatomy or Private Practice. This is the time for no tears, female empowerment, light drama, the supernatural, and scandalous adventure (with of course as much romance as can possibly be squeezed in).